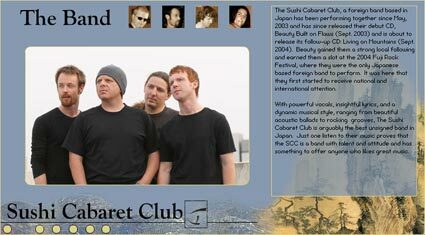 A site I created for a local band in Nagoya, Japan. They were starting to rise in popularity and wanted a site they could use for news, event dates, album release dates, and sample music. I designed the site around their album's cover art. After they released a second album and rose again in popularity, I redeisgned the site around the new cover art and added some Japanese Language functionality for their rising Japanese fan base. Eventually they became popular enough to hire a band manager, at which time control of the site was taken from me. Apparently the manager wanted to go with a Japanese web designer he knew because their popularity among Japanese had grown so much. Being that the current version of the site isn't my work, I've uploaded the files to my server so you can see what it was like.